Writer, educator and activist Dr. Niigaan Sinclair will visit Brandon University (BU) for a free public talk on Monday, Feb. 4. Dr. Sinclair’s presentation, Forgetting to Dream: Reconciliation in Reverse, will begin at 6 p.m. at the Lorne Watson Recital Hall, in the Queen Elizabeth II Music Building. The talk will be followed by a Q & A with the audience. Dr. Niigaan Sinclair will speak at the Lorne Watson Recital Hall at Brandon University on Monday, Feb. 4. Niigaanwewidam James Sinclair is Anishinaabe (St. Peter’s/Little Peguis), an Associate Professor, and former Head of the Department of Native Studies at the University of Manitoba. He is an award-winning writer, editor and activist who was named one of Monocle Magazine‘s “Canada’s Top 20 Most Influential People” and is currently a columnist with The Winnipeg Free Press. 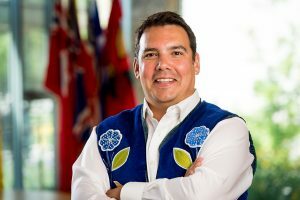 He is a regular commentator on Indigenous issues on CTV, CBC, and APTN, and his first book, on Anishinaabeg literary traditions, will be coming out with the University of Minnesota Press in 2019. The talk by Dr. Sinclair leads into a busy stretch of events during BU’s winter term that will promote a greater understanding of Indigenous culture and knowledge in the community. Among the upcoming events is Indigenous Awareness Week, which will take place the week of Feb. 11. “It’s encouraging to see that there are many groups on campus taking initiative and highlighting the importance of Indigenous culture and knowledge,” said Lisa Park, BU’s Diversity and Human Rights Advisor. Indigenous Awareness Week, organized by BU’s Indigenous Peoples’ Centre, will include a pipe ceremony, an Inuk drum performance, cooking bannock over a fire, a workshop on making moss bags, and a vigil for missing and murdered Indigenous women. Harvest Hall at BU will be the site of the Louis Riel Day Fun Family Celebration, presented by Grand Valley Local, on Monday, Feb. 18. The event will take place from noon to 4 p.m., featuring free food, face painting, jigging lessons and a live band performing traditional music. On March 5th, the BU School of Music welcomes Polaris prize winning Indigenous composer Jeremy Dutcher as part of its pro series. Dutcher’s debut album, Wolastoqiyik Lintuwakonawa, consists of operatic interpretations of traditional songs and is sung entirely in the Wolastoq language. Also in March, the Faculty of Science at BU will bring in Dr. Stephen Crawford, who is researching ecology, resource management and the engagement between traditional knowledge holders and Western science at the University of Guelph.